Headlamps. Most people don’t realize how nice it is to have a headlamp until they’ve tried one after being without one. They’ve tried putting up a tent in the dark, stumbled to go to the bathroom in the dark, or just walked around in the dark. A headlamp solves so many issues with activities like camping, hunting, backpacking and trail running. Of course they’re not limited to camping, backpacking and trail running uses but also regular running and hiking. Headlamps not only let you do things in the dark, but it frees your hands. We used to do a lot of tent camping and had a LED lantern that we absolutely loved. It was bright, lightweight and had a great handle. Then my wife bought some headlamps and I can honestly say that we haven’t used a lantern since. Anyhow, enough about my love for headlamps. Today we’re taking a look at five different headlamps by different brands. They have different features and modes that we’ll talk about, but the most important thing is that they’re bright enough to be used at night. Energizer will probably be the most recognized brand on today’s list. They’re known for making batteries and light bulbs. Put those two together and we get a headlamp. That’s what Energizer has done with the Energizer Vision LED and the result is a pretty basic headlamp. It comes in several different sizes where the lumen and number of modes is what increases. The smallest one has 2 modes (high and low) and max 100 lumens . Then there are 3, 5, 5, and 6 modes with 200, 250, 315, and 400 lumens available. All the available modes on the most advanced option is high, low, flood, night vision, green and red emergency strobe. All of the variations run on 3 AAA batteries, which makes them a little bit old fashioned. It would’ve been sweet to charge these with USB, but if you’re not planning on using the light everyday it can be a great headlamp. The problem if you were planning on using it everyday is that you would have to change batteries in it every week depending on use as it runs for up to 10 hours on the high mode. Depending on how you want to use it, the light pivots up and down to control the beam. On high, the light beam can reach up to 35 meters away and if that’s too much for you, you can turn it to low. If you’d like a beam reaching longer than 35 meters, the bigger options offer 50, 70, 85, and 80 meter beam distances on high. The Energizer Vision LED headlamp will survive drops from up to 1 meter. The smallest model is not water-resistant, but the 200 lumen and up will take a splash of water without damaging it. I recommend the Energizer Vision LED for the people that only need to use it once or twice a week. It’s not my first pick for runners, backpackers or trail runners as there are better options with easier charging methods than having to carry extra AAA batteries. Foxelli’s headlamp is a rechargeable one that I really like. Its functionality is basic, but since you can recharge it with USB, it could be the headlamp you use everyday for camping, running or backpacking. Pair it with a portable battery and a solar panel and you can have endless lighting on a backpacking trip. It only comes in one size, but you have 8 colors to choose from. 180 lumen, and 5 light modes are available on each. High, low, strobe, red light and red SOS light are the modes. Foxelli advertises up to 40 hours of constant light, I assume that is on the low setting. When the battery has run out, you can plug the included USB cable into it and recharge it in 4 hours. The battery itself is a 1200mAh lithium battery. A 45 degree tiltable body lets you control the beam that reaches up to 91 meters on the high setting. One feature I really like about the Foxelli MX200 is that if you turn on a setting and leave it there for about 10 seconds, the next time you click on the settings button it will turn off the light. To cycle through modes, you’ll have to do it within those 10 seconds. This makes it very convenient to use since you won’t have to cycle through all modes to turn it off. IPX5 rating means that you can wear it in heavy rain without risking damaging it. Cold or heat won’t kill it either, making it a great option for winter campers or runners. The most impressive thing about the Foxelli MX200 is the weight, it only weighs 2.4 ounces. You’ll barely feel it on your head. For runners this is one of the most important specs because even though 10 ounces with a different headlamp doesn’t sound like a ton, it becomes noticeable to some while running. I recommend the Foxelli MX200 for runners, campers, and backpackers that want to be able to use their headlamp everyday and quickly recharge it to be ready for another day. Five modes, 180 lumen, and the long battery life, makes it a very capable lightweight headlamp for the price. 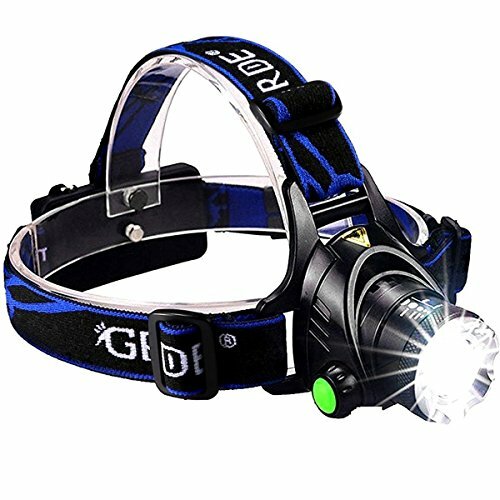 One of the more advanced headlamps on today’s list comes from a company called GRDE. As the name implies, it has a zoomable beam with three modes. What the zoom does is that it focuses on a smaller point you’re looking at. The three modes are low, mid, and strobe. GRDE advertises up to 1800 lumens, which is impressive for a headlamp. With lots of lumen come less battery life. In the low mode the headlamp will function for up to 7 hours, 5 on medium and 4 on strobe. An adjustable headband that also goes over the top will make sure that the headlamp stays on your head. The battery box sits in the back with two rechargeable AA 18650 batteries in it. If you want to buy batteries to change these out, make sure they’re type 18650. You will have several ways to recharge those batteries. Either the wall, car or through USB. All of those cables are included which is great. You can tilt the light up to 90 degrees. That means that the light can be pointing straight to the ground if you would like. So is the GRDE Zoomable headlamp the perfect headlamp for you? It could work for running, but note that it weighs 12.8 ounces. The adjustable band on top helps runners though as the headlamp will stay in place even during bumpy activities. For camping it can be one the best choices when you need a strong light outside at night. I could also see this being used while hunting, with the zoom feature making it easy to send all light toward a certain point to focus on. Something that could also be useful when exploring caves. If 1800 lumen isn’t enough for you, how about 6000? Cobiz has made this headlamp and advertises 6000 lumen, which is the highest out of all products in today’s comparison. I feel obligated to add something here. Just because a headlamp is advertised having more lumen doesn’t always necessarily mean it’s going to be brighter. So take those lumen numbers with a grain of salt. Cobiz headlamp has tons of neat features, and it looks heavy duty as well. Let’s get started with the modes on this lamp, it has four of them. Low beam, high beam, all bright, and strobe. To understand the difference between them we must first note that there are actually three lights on this headlamp, not just one. The low beam turns on the two smaller lights on the each side, while the high beam only turns on the middle light. All bright means all lights on, and strobe means all lights on but on a more focus point. A more focused area can also be lit up with the zoom feature. It lets you zoom in and out, making the lit area smaller and bigger. Together with the 90 degree tiltable body, it becomes a very versatile headlamp with many uses. Just like the GRDE headlamp above, there is an additional band that goes over the top of your head to further secure it. Great for running and heavy duty work. The headlamp has a IPX4 rating, meaning that it’s water-resistant even though it has wiring going along the band. To charge the headlamp you’ll use the included USB cable. It doesn’t come with a wall or car adapter so that’s a minus, but at least the USB charging cable is included. It also includes a nice storage box to protect the headlamp while not in use. I like the Cobiz headlamp because of its versatility. It has enough modes for lots of uses, a zoom, a rechargeable battery, a protective case, IPX4 rating, and a 90 degree swivel ability to make it easy to angle the light to where you need it. Even though it weighs 13.6 ounces, it would be a great trail running light and camping choice. Being able to easily charge the batteries with USB is a crucial feature for somebody like me that don’t have access to shore power most of the time. If you’re looking for a USB power bank to charge devices with like this headlamp, check out my post about the best portable power banks by clicking here. Last out in today’s comparison is the Black Diamond Storm Headlamp. Black Diamond is a company known for their high-quality outdoor gear, and their headlamps is no exception. This is a very reliable and durable headlamp. It’s the only headlamp on the list that is fully waterproof with a IP67 rating, meaning that you can submerge it down to a meter in water for at least 30 minutes. The rating also means that it’s dust-proof. Unfortunately, it uses AAA batteries but with a burning time of max 160 hours on the low setting, it’s still a great choice for campers and hikers. At 3.2 ounces, it’s also extremely lightweight. It has a tiltable body but won’t tilt as far as to 90 degrees like some of the others. A 350 lumen LED light will keep the trail lit for you up to 85 meters ahead, and 8 different modes can be used in different situations. You’ll get a full strength in proximity and distance modes, dimming, strobe, red, green and blue night-vision and a lock mode. More modes let you do more activities with your headlamp that doesn’t necessarily require light far ahead, like cooking or reading. If you need a headlamp that is fully water- and dust-proof, this is one of the best ones out there. Black Diamond has made a great headlamp with a strong light and a bunch of modes. 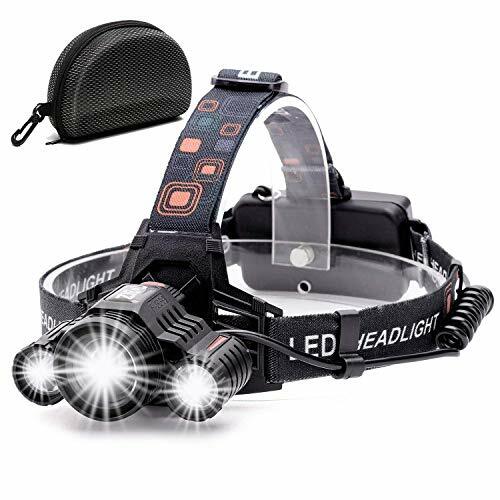 I would feel confident heading into the dark with this headlamp, and that’s what it comes down to, does it feel like a toy or would you feel confident in the dark with it? If it’s the only light you have, it must be reliable. What I mean with the intro title “The best headlamp is the one on your head” is that any headlamp is better than no headlamp at all. You don’t have to go buy the most expensive headlamp, as it might not be the best one for your uses. Try to think of what you’ll be using the lamp for most of the time, and choose accordingly. I have my recommendation based on the features and versatility, but look through all of them before you decide what is the best for you. Cobiz Brightest High 6000 Lumen – There are several reasons I chose the Cobiz as my top pick. The adjustable bands that sit not only around your head but on top of your head will keep it secure for activities like running and rock climbing. The four modes is enough to give you both a low and high beam of light and the zoom will let you focus on a certain point. Although not fully waterproof, it’s water resistant to where you can be out in the rain or snow without having to worry about damaging it. It charges through USB, and last but not least, it comes with a case to put it in for storage which is always appreciated. Overall, it’s the most versatile headlamp on the list and that’s a big reason why I recommend it as well. 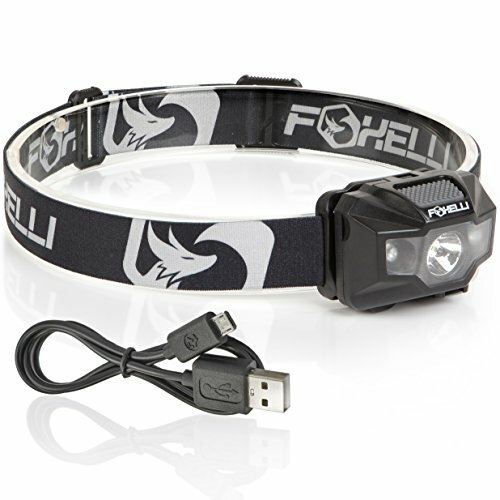 Foxelli MX200 USB Rechargeable Headlamp – The Foxelli MX200 is a great choice. You get a rechargeable battery that lasts up to 40 hours on a charge, and it’s extremely lightweight. It has the basic functionality most people are looking for in a headlamp, and I feel confident recommending it. If you’re looking to purchase a headlamp, you probably already know why you’re going to need it. Maybe you’re going to be tent camping, want a light in the RV in case the battery is dead, like to go trail running, or hike into the mountains to hunt early in the morning. Whatever your reason might be, there are a few things to consider, so let’s talk about them. Battery – If you need a headlamp for everyday use, I would go with a rechargeable option. Having to buy batteries every week will get expensive real quick, and it’s going to make you use the headlamp less. Although, if you only use the headlamp for three hours every weekend, modes, bands, and weight becomes more important factors to consider. Lumens – I don’t recommend thinking too much about lumens, as battery and modes are more important things to consider. Especially since some companies advertise extremely high lumens that aren’t realistic on headlamps. Modes – How many modes you need depends on how many activities you’re planning on doing with it. If you mostly plan on cooking and reading you probably won’t need a three light headlamp with zoom. The most advanced headlamp isn’t the best choice for everybody. Weight – There are weight differences between the headlamps we’ve looked at today, and if you think that is something that is going to bother you, go for a light one. I have worn a headlamp that weighed a pound, and to be honest it didn’t really bug me at all. It’s more important to me that it sits secure on my head, than the weight of it, but we’re all different. Bands – If you want a headlamp to put on your yellow construction helmet, how many bands there are and how adjustable they are will matter. Not all of the headlamps we’ve looked at today can fit on a yellow helmet, especially the ones with bands going over the top of the head. Sometimes just looking through the reviews of a certain product will tell you whether it can be put on top of a yellow helmet or not, so do some research on this before you purchase anything so you don’t end up with one that falls off the helmet.